Last month chamomile, and this month, this. I might just as well change the name of my blog to she who eats flowers. Maybe. 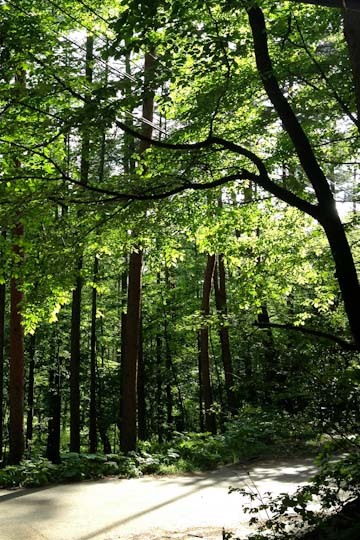 Towards the end of May, when the young, tender green of the trees becomes more intense and richer in the mountains around here, a vast part of the scenery suddenly gets a thin, cream-white veil over it. And that's acacia flowers in bloom. 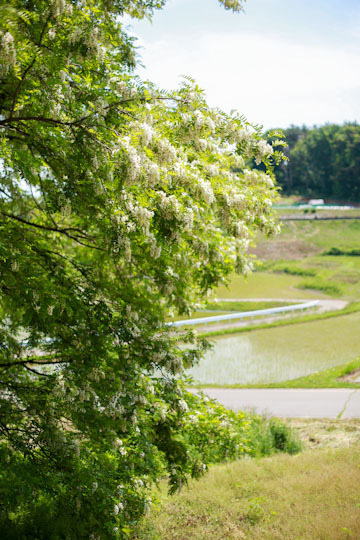 Known as Robinia pseudoacacia or 'false acacia', they are literally everywhere here in this part of Nagano. In fact, they are everywhere around the country, apparently; there must be a lot of them in and near Tokyo, but I never saw them. Well, I probably did, but I never took notice. I wouldn't have recognized them as acacia, come to think of it. I'm terrible with trees, flowers, and plants in general. When I think of acacia, I've always associated it with acacia honey. Golden yellow, mild-flavored sort. Ubiquitous, easy to use. Then again, I never really wondered how acacia flowers would look like, and wasn't interested at all in finding it out. Then I've come to spend a lot of time in Nagano over the past several years, and now that I'm here, it's hard to miss acacia, even for me. At least when they are in bloom. You see them literally everywhere along the roads and in the mountains. And when I first stopped to smell the flowers, I was amazed at how they smelled so like acacia honey. Which shouldn't come as a surprise, of course, but I found it fascinating. 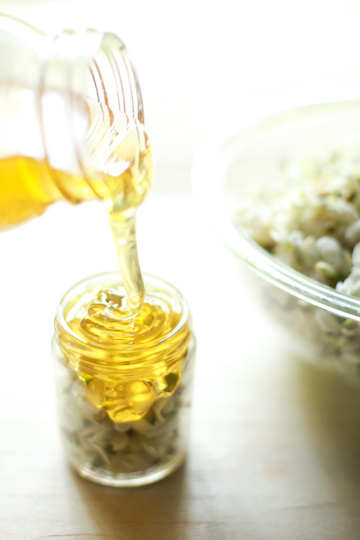 As I like white flowers in general, and I've been using local acacia honey a lot these days, I had more or less favorable feeling about acacia; pretty and useful, you know. Then I was told that acacia in fact can be a rather troublesome thing, especially for farmers. Because the tree is so fast-growing and spreads wide and quick, acacia tends to invade its neighboring　forest and farmlands. And I kind of see what they mean; acacia trees really do seem to be everywhere, all of them huge and powerful, hanging over or knocking off other tress around them. So, isn't there any use of acacia other than getting honey out of it (with a tremendous help of bees)? 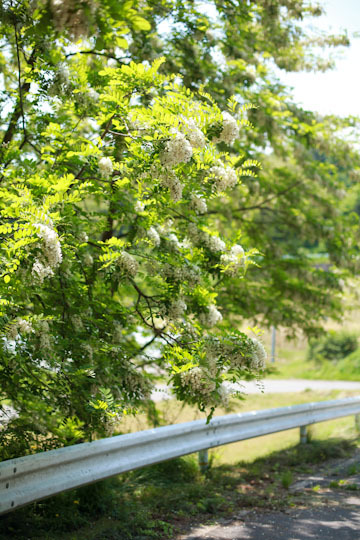 "They make tempura with acacia flowers", my mother mentioned it in passing as we drove through acacia-lined country road a couple of years ago. The idea intrigued me; I mean, flower tempura? Really? I was curious, but never got around to actually trying it - until this year. Earlier this month I suddenly decided that I wanted to try acacia tempura, and talked mother into going out to pick some flowers. Even though they are abundant by the roadside everywhere, we went for a quieter place with less traffic, off the main roads. According to my little research, it was best to use blossoms that are only just blooming. 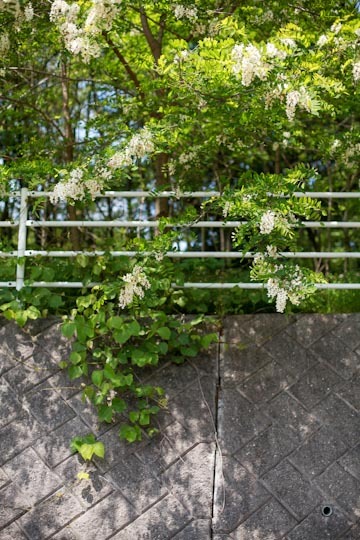 It was in the beginning of June, and while the flowers seemed to have past their prime in most parts, there were still plenty of trees with flowers just about to bloom, especially in their north-facing parts. 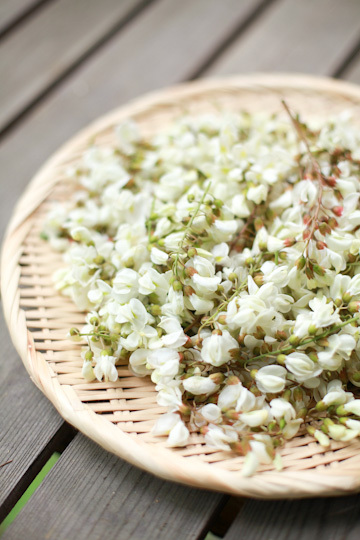 In less than half an hour, we got ourselves a bagful of fresh blossoms. 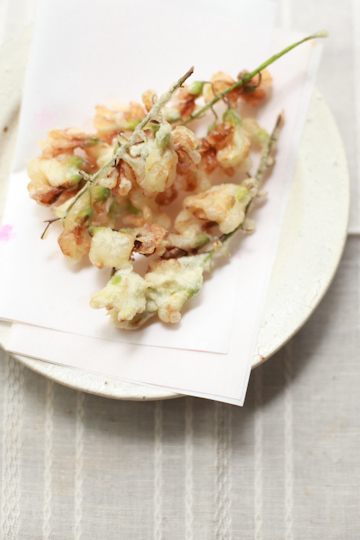 And on top of my list of things to do with flowers was, of course, acacia tempura! ...well, it was the first thing I meant to do with acacia , but for some reasons it was actually the last thing we made with the flowers. And when we finally did, there wasn't enough flowers left in an ideal state. So we only had a few clusters for tempura, just to have a taste. "It's not so much about taste, really," my mom had warned me, perhaps a little alarmed by my overenthusiasm before trying the acacia tempura. And she was right; I didn't really taste anything much, other than the tempura batter coating the blossoms. Nonetheless, it was delightfully light and delicately crispy, and I enjoyed it very much. I certainly wouldn't mind having it again. While we had the tempura with a sprinkle of salt or a soy sauce-based tempura dipping sauce, I've learned that deep-fried acacia flowers, or acacia fritters, are often served sweet elsewhere in the world. That is something I'd like to try next time. 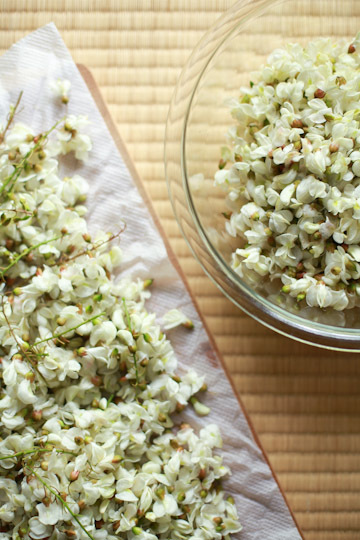 For now, I went non-deep-frying routes to serve my acacia flowers sweet. First, with ricotta (homemade!) and strawberries. No, not those blossoms sitting demurely atop the ricotta that I'm taking about, but it's the brown stuff in a carafe. It's acacia syrup, or a syrup infused with fresh acacia blossoms. I used a recipe here, with a few minor changes - replacing some of the sugar with honey (acacia! ), adding a bit of white wine. My syrup turned out brown, most likely because of the natural cane sugar I used; this may have been a good time to use white granulated sugar for aesthetic reasons. Apart from the rather unattractive color, it tasted nice and paired really well with ricotta and yogurt. It also served as a lovely sweetener for a cup of tea. 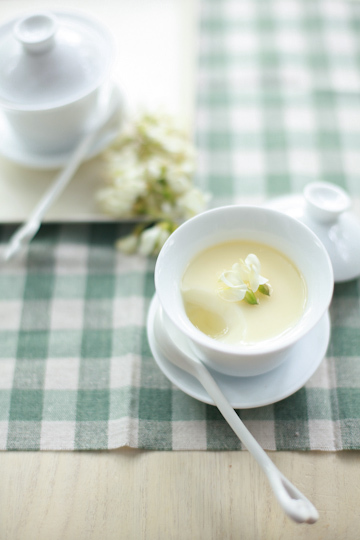 This is acacia and honey pudding, a milk-and-cream mixture infused with acacia blossoms, set with gelatin and served with clear, runny acacia honey. In essence, it's panna cotta - except I've decided not to call it so in a vain attempt to avoid repetition. I feel that I've been relying on this simple dessert a little too often (most recently with chamomile just the other day). 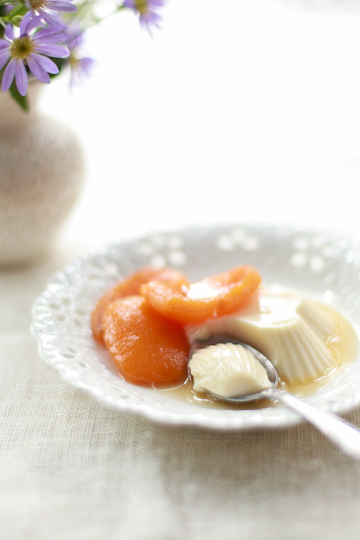 But to be fair, panna cotta milk pudding really is a good thing to make when you try to showcase a delicate flavor in a dessert, and it worked here too. 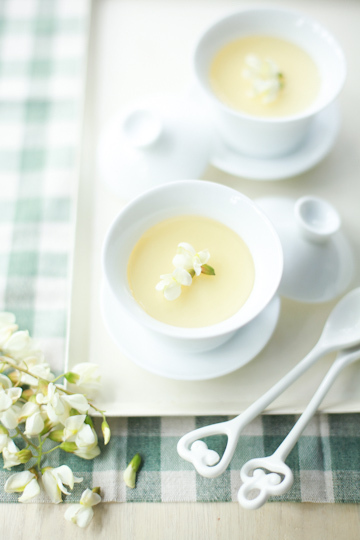 Combine some milk and cream and add a handful of acacia flowers. Bring the mixture to a near boil, them remove from heat and let it cool overnight. Strain the mixture to remove the flowers. Warm again and dissolve a bit of honey (acacia!) to sweeten, then add unflavored gelatin. 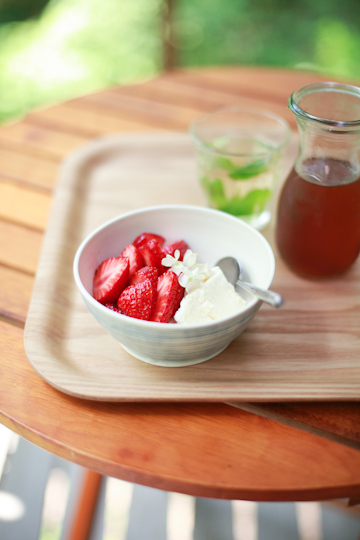 Chill until set, and serve with a small spoonful of acacia honey. As is the case with the chamomile panna cotta, the flavor of acacia was rather very subtle, but it is meant to be so. Flowery taste can be pleasant only as long as it's not overpowering. Now, there were a bunch of other things I thought I'd try and make with acacia flowers; cakes, pancakes, omelets, salads, and so on. But I didn't get to make any of it this time, as I ran out of time (work got suddenly a whole lot busier right after we picked the flowers.) Which is too bad, especially when I spent so much time cleaning and sorting the blossoms in the first place. Oh well. 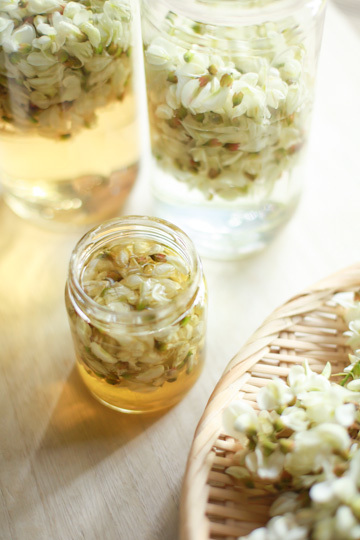 And what I did manage to make with these cleaned blossoms? Here in Nagano we are lucky to have access to pretty decent local honey at pretty decent prices. This has allowed me to use honey extensively in cooking and baking. 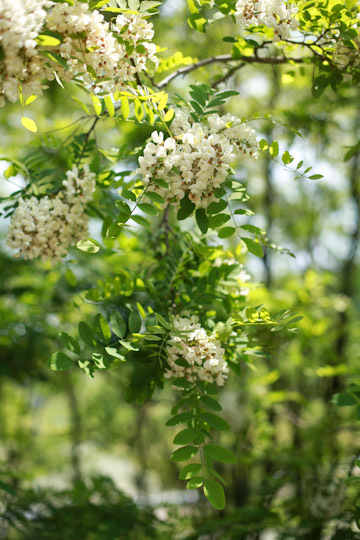 The two varieties I usually get are a wild and bold multifloral, and a light and mild acacia. I often turn to acacia honey when I am dealing with a delicate flavor and don't want to let the honey overpower it. In other words, I tend to use acacia honey for its mild flavor that doesn't get in the way of other ingredients, rather than to highlight its own characteristics. As I've come to appreciate the acadia honey's own floral flavor, I thought I'd try and enhance it by adding acacia blossoms to acacia honey. 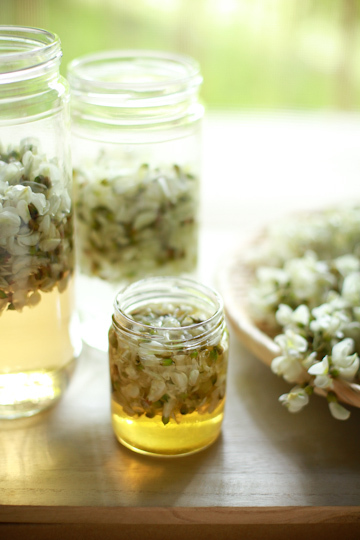 ...or perhaps, it's just what I do: infusing honey with fresh flowers, as I did with chamomile. So acacia flower infused acacia honey it is. And while I'm at it, I might as well infused some alcohol with the flowers, too. Same old, same old. I came across a few different recipes when I was searching the Internet for 'acacia liqueur', and I decided to try two different ways. One was this, where you steep flowers in a spirit first and sweeten it later. The other way I tried was to use white wine mostly (with a shot of rum added to it), again as I did with chamomile, based on this recipe. Both the honey and liqueurs are now sitting in a dark corner of our place, alongside their chamomile-version cousins. There are among the first of many jars and bottles of homemade preserves/concoctions that will soon fill up our cupboards and other small spaces during the summer. Season's fruits! They brought me a handsome melon and a flat of the most beautiful loquats I've ever seen. I'm not certain how many of you are familiar with the loquat, also known as the Japanese medlar. Here in Japan it's one of traditional fruits and has been around for a very long time. So in that sense it's a familiar fruit for many of us I suppose. Somehow, though, it's not one of the more ubiquitous fruits around, either because it has an extremely short season and comes and goes in a blink of an eye, or simply because it's just not that... palatable? It can be sweet and juicy, but often quite astringent and lacks a crunch that appeals to me. But maybe I'm biased, as I can hardly say I've eaten loquats enough to give a fair verdict. 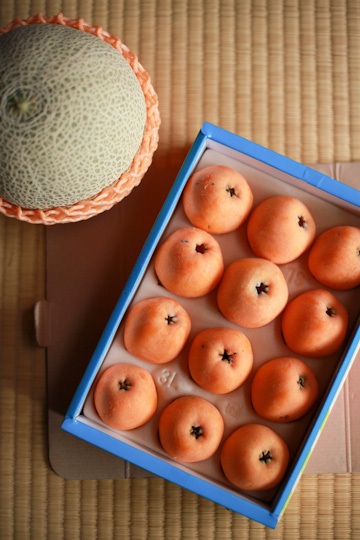 Besides, while Nagano produces a large variety of fruits including those that are not widely grown in many other parts of the country (such as rhubarb, gooseberry, apricot, nectarine, blueberry, and prune plums), loquat isn't one of them. So for one reason or another I hadn't eaten loquat for a very long time, and never exactly missed it. Although a lot of folks here would consider it an insult to cook fruits that are clearly meant to be eaten ripe and fresh like the specimens our guests brought to us (I know many people shudder at the thought of cooking perfectly ripe, expensive Japanese white peaches, for instance), they assured me that they'd brought the fruits so I could make some desserts (they know me!) - so I got to it at once. First thing I made was vanilla poached loquats, which is... what the name says, basically. I looked up recipes in this book and here (in Japanese), and cooked some peeled and seeded quarters of the fruit gently in a small amount of water along with a bit of sugar, honey, white wine, lemon (both peel and juice), and vanilla bean. The sweet smell that filled the kitchen while it was cooking was heavenly. In addition to the beautiful compote, the cooking liquid made a nice syrup, wonderful when added to tea or even just a glass of iced water. And now, the white thing served alongside the compote? 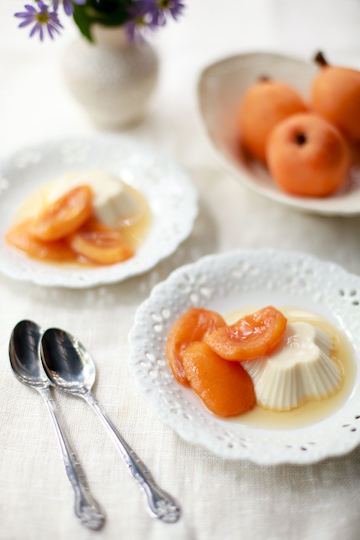 It's loquat blanc-manger, and ahem, NOT panna cotta (no, really!). 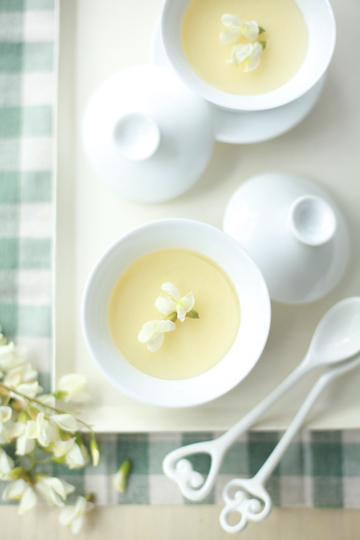 Here the milk-and-cream base is flavored with not the flesh of loquats but their kernels. If you have ever cooked with apricot kernels, you know they have a distinctively sweet, heady aroma that characterizes the flavors of amaretto liqueur, amaretti cookies, and almond jelly, a Chinese dessert hugely popular in Japan (called annin-dofu). As a close relative to apricot, loquat happens to have kernels with a very similar flavor to that of apricot. 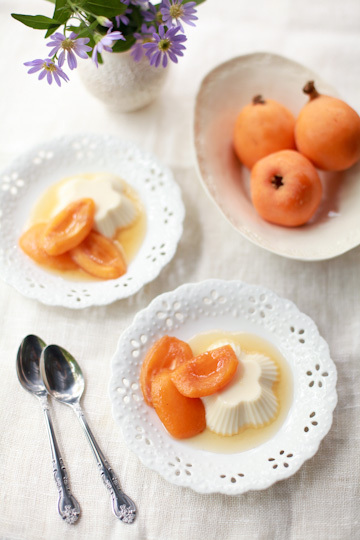 I learned this while searching for loquat recipes in Japanese, as I found a lot of recipes for annin-dofu-like pudding using loquat kernels. Intrigued, I decided to give it a try - after all, I had a whole lot of loquat seeds after making the compote. Here I used this recipe (in Japanese); you warm up a mixture of milk and cream along with finely chopped loquat kernels (to be strained out later), sweeten it with a bit of sugar and condensed milk, and add gelatin before chilling to let it set. With kernels of fresh apricots, you'd have to start by getting the kernel out of a pit, which seems like a tough job to do as apricot kernels are covered in extremely hard shells. 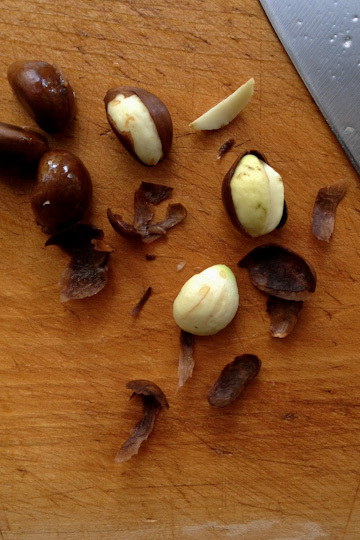 Loquat seeds, on the other hand, only have a thin peel that is easy to remove with a knife. At this stage, the kernels didn't have much of the amaretto aroma, and I was very tempted to use a few more kernels than required in the recipe. But I resisted, for loquat kernels, much like apricot kernels, are known to contain a substance that can be highly toxic when consumed in bulk. Here you use 2-3 kernels for a total of about 300 ml / 11 fl.oz. of cream/milk mixture. I made my pudding soft-set by increasing the amount of milk a little, and the flavor was distinctive but delicate. We all enjoyed it along with the compote. This little dessert was good enough to give me a chance to see loquat in a new light; from the next year on, I'll reach for this long-neglected (in my case at least) traditional fruit of Japan when I see it at the store during its short season. The month of June saw an increasingly larger, more colorful variety of fruits and vegetables available at our local green markets as the weather finally became warm. 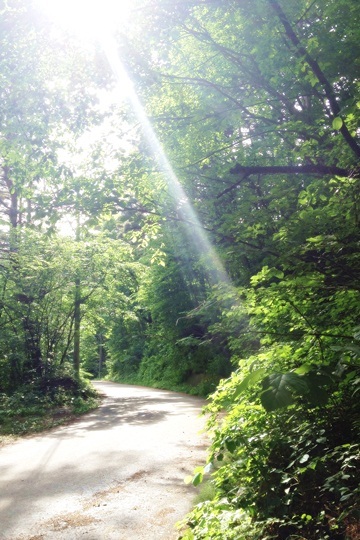 It gives me a sheer pleasure, after a long winter (and most of the short spring) where all you'd find are a bunch of root vegetables and odd leafy winter greens and mountain herbs. 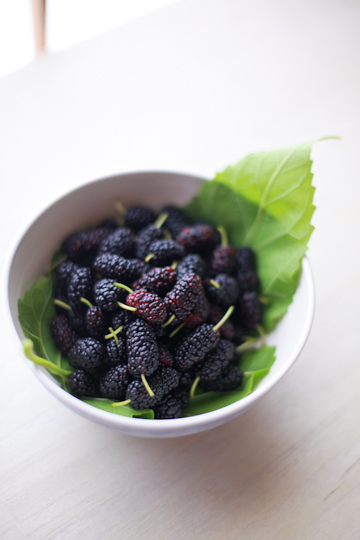 I look forward to occasional trips to the market, and on the last Sunday of June, my find was punnets of mulberries. Again, I'm not sure if mulberries are a common fruit where you are. They certainly are around here, and to a varying degree elsewhere in Japan, though not as much as they used to be back in the day. They are a sort of fruit that my parents or grandparents would pick off the tree as a kid, when there weren't nearly as many sweet fruits commonly available as today. 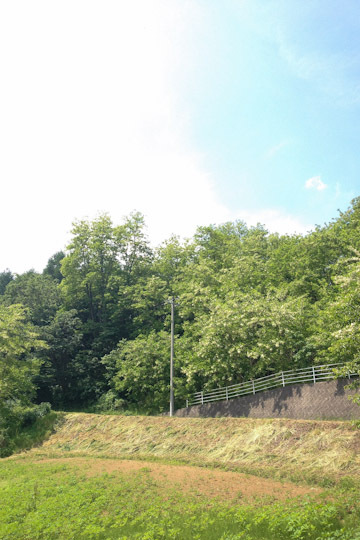 Mulberries seem to have become more or less a fruit of the past; I had never eaten them until I came to spend more time in Nagano, which is only a few years ago. I certainly have never seen fresh mulberries sold at stores in Tokyo. Come to think of it, I don't think I ever saw them at supermarkets even in here. Anyhow, as I picked up a few punnets of the berries, mother said "you can just go and pick them yourself" - which I decided to do, with sheer excitement. On the following morning or so, I dragged myself out of bed painfully early (for me) and headed out to one of my folks' farms, where they have a large mulberry tree. ... some still small and green, but a lot fully ripe and deeply dark. We forgot to bring a ladder with us (a clever move, or lack thereof) and only got to pick the berries off the branches within our reach. But still took home several bagfuls - a good couple of pounds in total. Now, let's make something clear: mulberries aren't my biggest favorite of berries. There are reasons why the fruit has become less popular in our day. 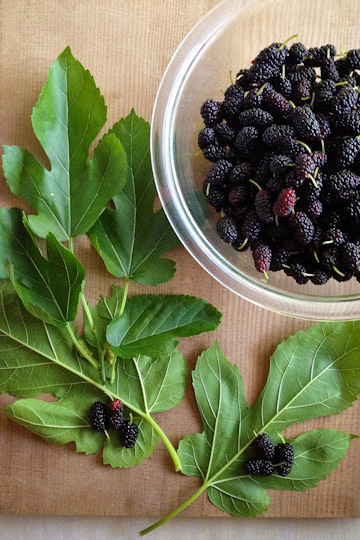 Unlike other berries such as strawberries, blueberries or raspberries that are burst with vibrant flavors, mulberries aren't particularly sweet, tart, or aromatic; they can be a bit dull, to be utterly frank. 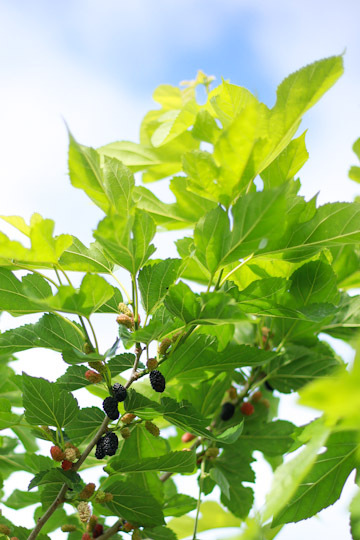 To add insult to injury, there is something a little too earthy or grassy about the taste of mulberry that makes me feel a lot of time as if I am eating an vegetable rather than fruit. But that doesn't mean they don't taste good; their flavors vary widely and some are truly sweet while others are bland. By and large, they make an excellent snack that you can munch on by the bowlful (the key, in my opinion, is to leave out the long stem that runs through each [multiple] fruit). 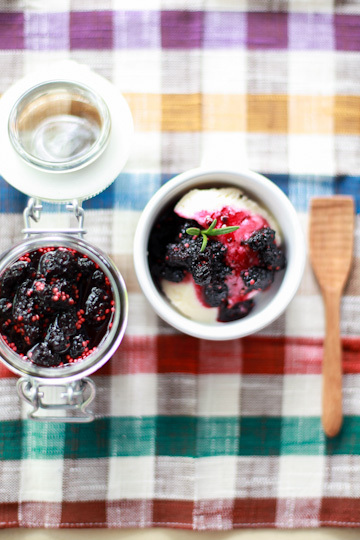 The first thing I made with our mulberries was, perhaps a bit unusually, a savory dish. 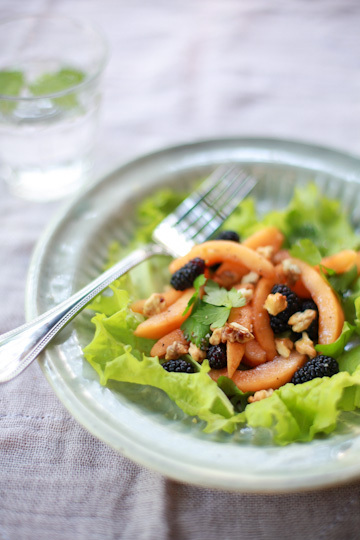 I made a mulberry and loquat salad, inspired by this recipe (in Japanese). It was a naked salad of mulberries, loquat slices, walnut pieces, and some greens, without dressing, or even a salt. I chose to dress my salad though, with a splash of olive oil and balsamic vinegar, and salt and pepper. It was a refreshing salad, certainly an interesting one - although I did prefer loquats cooked than fresh. After that, everything I made was, not unusually, sweet. 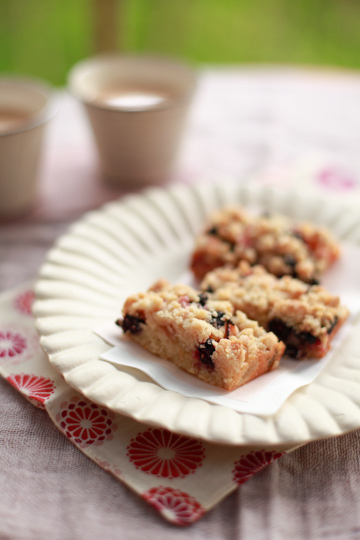 When I was thinking what to do with my mulberries, I didn't come across too many mulberry recipes that I wanted to try. So I looked out for recipes for blackberries (which aren't the same as mulberries but similar in some ways), and this is one of them. 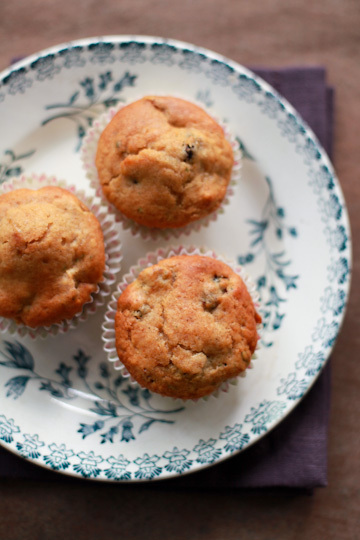 I made these mulberry muffins using this recipe for blackberry muffins, and they turned out great. I couldn't bother to make the crumble topping, but I wish I had; the muffins still tasted good without it, but the crisp crumbles would have made them all the more interesting. 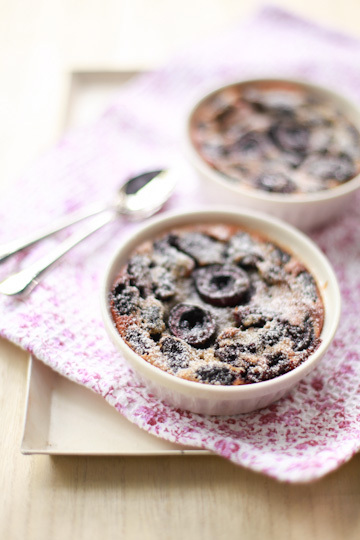 I was delighted to find mulberry recipes in the archives of Aran's gorgeous blog Cannelle Et Vanille, and this was the first thing I tried: mulberry, cherry and pistachio clafoutis, from this recipe. 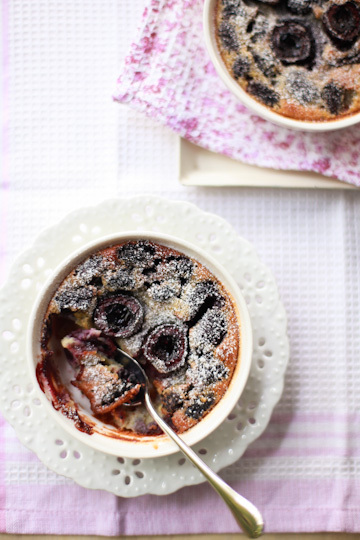 Cherry clafoutis is something of an old standby dessert, but here Aran gave it a fresh twist by using ground pistachios and coconut milk - and an addition of mulberries. 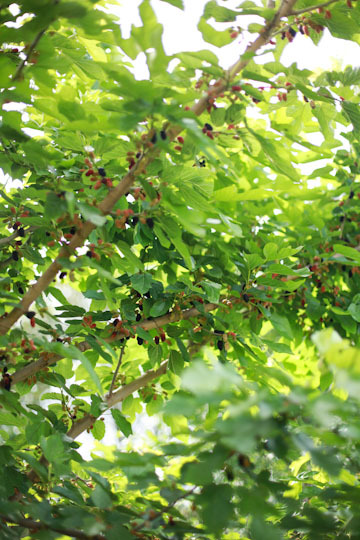 It was packed full of fruits, where plump, meaty cherries made a nice contrast with soft mulberries. I'm not a huge fan of clafoutis in general (except, perhaps, for the kind I have been making for the past couple of years), but this delectably unusual coconut milk version quickly won me over! 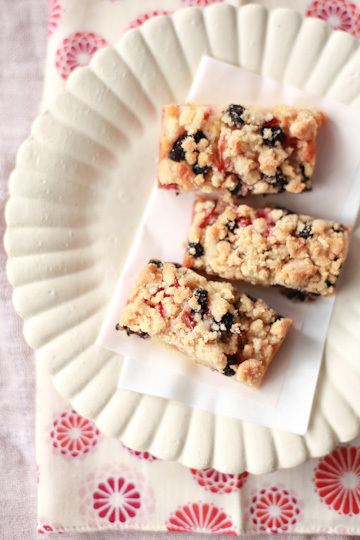 It's for mulberry and rhubarb crumb cakes, in which juicy fruits are sandwiched between soft cake and pebbly streusel. It's a pretty cake to look at, but it was the combination of mulberry and rhubarb that I fell in love with. Sure, I love almost everything with rhubarb, and yes, rhubarb is known to go well with berries - but still, the rhubarb-mulberry match charmed me. 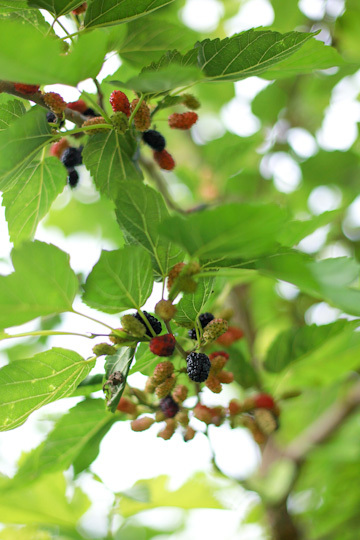 Besides, mulberries need something tart to brighten up their flavor, and rhubarb fits the bill. I was out of lemon when I made this, so added some ground cardamom instead, which wasn't too bad. I imagine some chopped nuts (walnuts for instance) wouldn't hurt, either. And if you don't have mulberries, other berries will definitely work well, too. 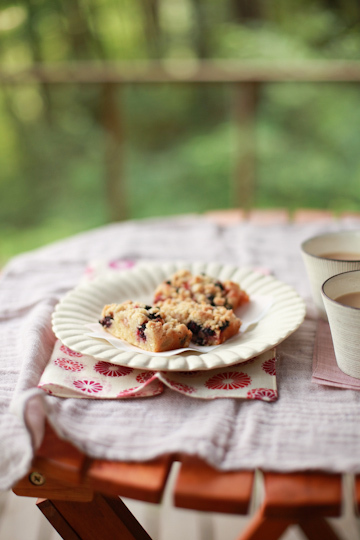 This was a perfect teatime treat, and while it tasted good on the day it was baked, I found it tasting even better on the following day - though the streusel wasn't as crisp as it was on the first day. 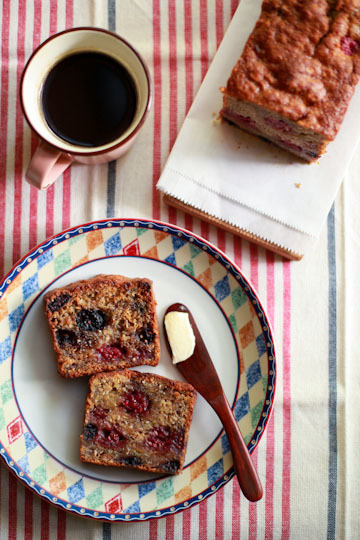 And incidentally, these cakes - as well as the clafoutis - are gluten-free, as with most recipes Aran shares on her blog. And while I was baking away, I also made something to preserve the berries. ...in, why, alcohol! Surprise! No?? Another interesting thing about this recipe is the addition of roasted almonds. Apparently, mulberries and almonds are great friends. I've never used nuts in homemade liqueurs save for nocino, or young green walnut liqueur, that I made a few years back (which turned out to be delicious). I can't wait to see how this one will come along. In addition to the liqueur, I made another preserve (and for once, it's not a honey infusion). 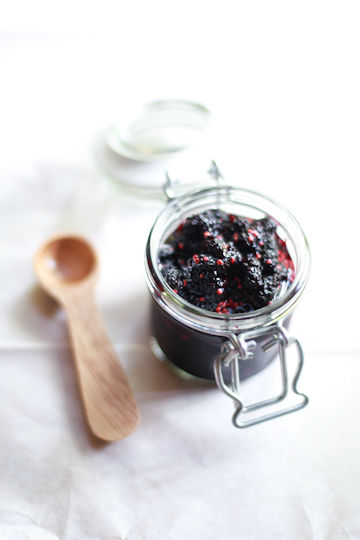 It's spiced balsamic mulberry preserve, based on a recipe I found here. I'm not big on jams and preserves, but always up for new and unusual flavor pairings, especially herbs and spices. 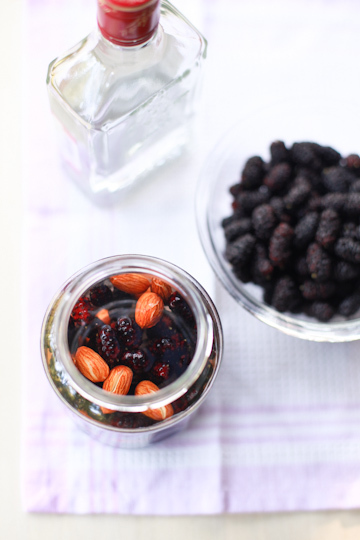 This recipe combines mulberries with balsamic vinegar, lemon, rosemary, nutmeg, and (black) pepper, which in my book sounds downright heavenly. So I whipped up a batch, with a bit of changes - replacing some of the sugar with honey and adding a vanilla bean. The resulting preserve was deeply aromatic and full of character. It's been making a lovely accompaniment to my morning bowl of yogurt, and was fabulous with simple vanilla ice cream. Next time I might cut down on sugar a bit, and also go a little easier with vinegar as well. 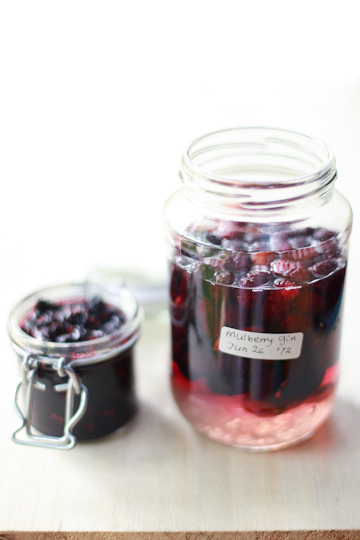 As I cooked the preserve, I noticed that mulberries wouldn't collapse into chunky paste in the way other berries do. I suspect it may have something to do with a stem that runs all the way through a berry (or more precisely, a cluster of berries) and holds the berry together. You can't remove it without breaking up the berry, but it's not unpalatable once it's cooked - so I don't think many mulberry recipes would tell you to remove the stem completely. Dark purple mulberries stain the pale green gooseberries completely, and gooseberries get crushed to a pulp easily once cooked, disappearing into the purple mixture. 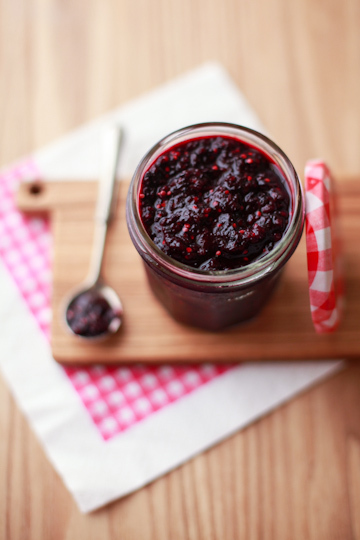 So my mulberry jam was soft and elegant, just the right balance of sweet and tart. Ice-cream! It is finally getting warm enough for occasional ice-cold treats here in the mountains, and this is my first batch of ice cream this summer. 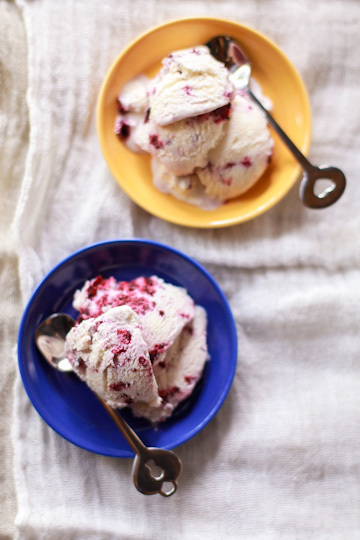 It's mulberry swirl ice cream - with a hint of amaretto, thanks to loquat kernels. 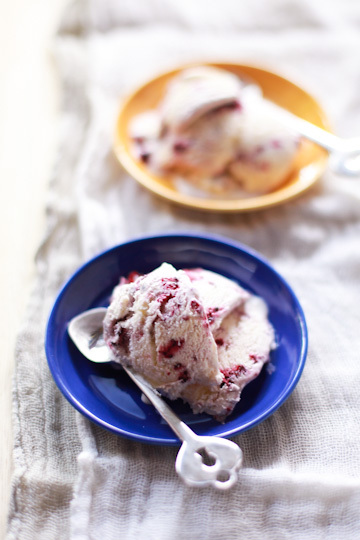 When I was searching for mulberry recipes, I found a one for mulberry and almond ice cream. It sounded great, but the recipe was a little too fussy for me to try, so I thought about doing a simpler alternative. Then I remembered how loquat kernels had a flavor that's so close to that of amaretto, which is basically flavored with almonds. And I also knew that loquat kernels have an affinity with milk and cream, so I was sure this was going to work. And it did, and we all loved it. Here I'm writing down how I did it, so I can make it again - and perhaps you can, too, if you are interested (and have access to fresh loquats). 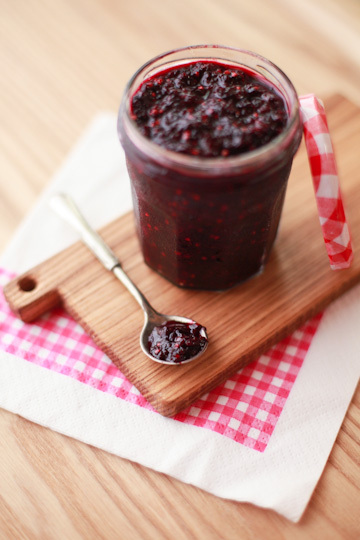 To make the soft mulberry jam, carefully rinse and stem about 300 g / 11 oz. fresh mulberries. (Remove stems as thoroughly as possible, or alternatively, process the berries in a blender or food processor until pulpy.) Combine the berries with 50 g / 1.8 oz. brown sugar and 70 g / 2.5 oz mild honey and leave it overnight to let the berries release their juice. On the following day, place the mixture in a heavy-bottomed pan over medium heat. Add about 50-60 g / 2 oz. fresh or frozen gooseberries, or 2 Tbs. juice of lemon. Cook, constantly stirring, until slightly thickened, about 15-20 minutes. Remove from heat and let cool. Chill until ready to use or up to a few weeks. Makes about a cup of jam. To make the ice cream, finely chop 4-5 loquat kernels (milk-white part only; dark brown peel removed). Combine the kernels with about 240 ml / 1 cup heavy cream and 2 Tbs. milk in a heavy saucepan, and warm over medium heat to a near boil. Remove from heat and add 2 Tbs. honey. Leave it to cool, then cover and refrigerate until thoroughly chilled. Strain through a sieve and remove the chopped kernels, squeezing out any liquid. Discard the kernels. Pour the mixture into an ice cream maker and freeze according to the manufacturer's directions. Alternatively, pour the mixture into a blender and process until very lightly whipped (it should take less than a minute; be very careful not to let it overwhipped.) Pour in a container and freeze until partially frozen. Tip the mixture back into the blender and process until smooth. Pour about a half of the ice cream into a container. Dot with 2-3 Tbs. of the mulberry jam. Repeat with the remaining half of ice cream and and another 2-3 Tbs. of jam. 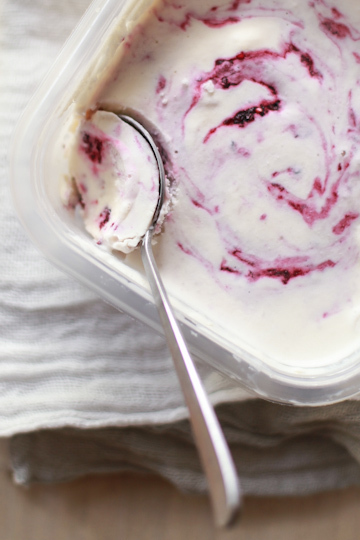 Using a knife, gently swirl the jam into the ice cream. Cover and freeze at least 2-3 hours, until ready to serve. As I type this, I'm eating the last of this ice cream, with a second batch already in my mind. Both loquats and mulberries can be hard to come by depending on where you are, so this probably isn't a recipe for everyone. But if you have a chance to get your hand on them, I hope you'll give this a go. The loquat kernel ice cream is quite delicious on its own or with other fruit jam/sauce, so it may be worth a try. I suspect you can make it with apricot kernels, but I haven't tried it myself. Maybe I will, when fresh local apricots make their appearance in my neighborhood stores. As for mulberries, I've used up all of the berries we picked and some more that I bought at the green market. I'm hoping to go to pick the berries again, sometime soon. So, that was how I busied myself for the past month. ...and there were a bunch of other things I made with more fresh produce available. June sure is a busy month. Meanwhile, I'm anxiously waiting for more summer fruits to show up at the store. Apricots and gooseberries should be here anytime soon. I should get ready, rounding up empty jars and bottles and making more room in the fridge and freezer. Beautiful and very impressive! You are very productive, I wish I had half of your energy to try all these recipes and shoot those beautiful pictures! Look at my blog, acacia tempura. Also in Italy we eat the same food. Spring food ! Wow! You have really very pretty pictures. Well, what do I expect since this blog is all about flowers. I am sure every post will be as pretty as a flower. I never thought flowers can be a delight to our taste buds too. You have gained another fan in me...Keep posting! You are amazing! Che meraviglia, ogni tuo post è una sorpresa piacevole, che delicatezza! All the pictures are wonderfully shot. You made it all look fresh and tasty and so yummy. I love your blog! I know you said you don't sell sakura products but I'm desperate. Do you know of anyone online who is willing to ship sakura sugar internationally to the United States? I saw the package of it in one of your photos and I've been searching fruitlessly. Thanks!!!! And I thought I wrote epic posts! Phew! 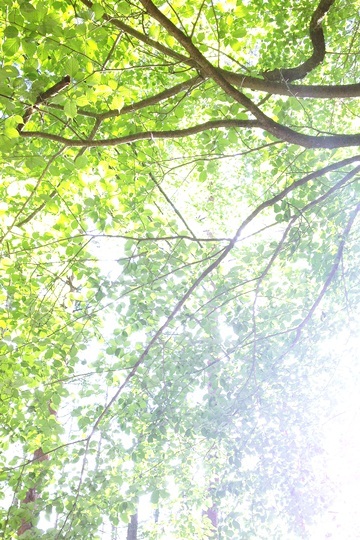 What stunning photo graphs and excellent ideas. I would love a bag of those flowers. I have no idea what acacia tastes like. So many beautiful moments in nature and with food. Hello all, thanks for your comments as always. much appreciated! Dulcistella & vivereitaliano - thanks! funny how we came to enjoy something in much like the same way, in two different places in the world! myfudo - thanks, but the truth be told this blog is far from a flower blog, as I'm helpless about flowers and plants in general. they are pretty to look at though! myfudo - i'm afraid i don't know any that would ship overseas. sorry! Jillian - you can find my email address on the right-hand side column on this blog if you'd like to get in touch. thanks!